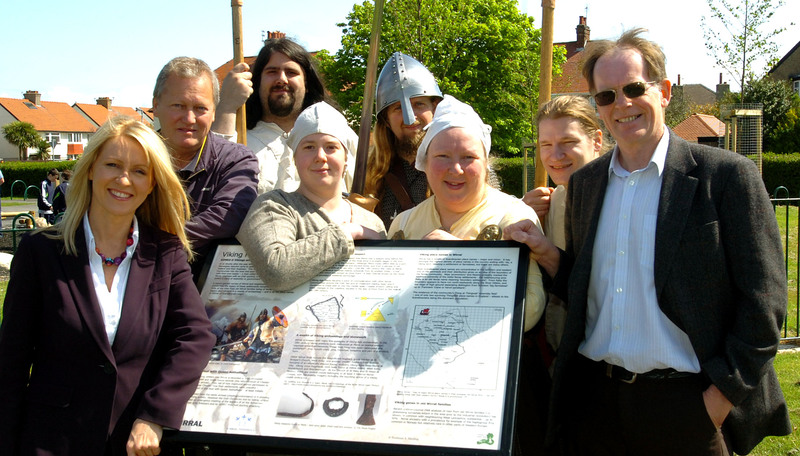 Viking history boards were unveiled in Meols Park on Saturday May 15th 2010 and it could be the first step towards a Wirral-Wide Viking trail. THE quest for a trail celebrating Wirral’s Viking past is gathering pace with the unveiling of a themed history board in Meols at the weekend. The Friends of Meols Park worked with Wirral Council and Wirral Viking expert Professor Stephen Harding on the project to give visitors an insight into the area’s history as a Viking trading port. It is hoped the idea will be taken up by other groups across Wirral – and there are also plans for a Viking statue if funds can be found. The finished board was unveiled by Esther McVey on Saturday, in her first official engagement as Wirral West MP. Other Viking-themed celebrations included a re-enactment in front of St John the Baptist Church. Professor Harding said said: “We hope that these boards going up will see the start now of a Wirral Viking trail and the next job is to raise the money for a statue.” Vikings are thought to have arrived in North West England over a millennium ago. After their expulsion from Dublin in AD902 the Wirral Vikings, initially led by the Norwegian Viking Ingimund, would have landed in their boats along the North Wirral coastline. Some historians believe a Viking boat is buried under the car park of the Railway Inn in Meols. Posted on June 2, 2010, in esther mcvey, iain dale, leisure, vikings, wirral globe, Wirral News, wirral west and tagged 7 waves radio, arriva, arriva buses, big lottery, cf merseyside, china crisis, Community, community spaces, community spaces fund, esther mcvey, flickr, Go Green, groundwork, http://blog.community-spaces.org.uk/, liverpool echo, Meols Park Refurbishment, omd, parks, Penguin, twitter, wirral council, wirral cvs, Wirral News, wirral news.wirral globe, wirral.community, wordpress. Bookmark the permalink. Leave a comment.